The 521CRED is a CAN based multi-channel rotary encoder that will allow the user to adjust an analog value with the encoder while monitoring it's update on the 4 digit display. The software is integrated with HMI CANconnect software suite. 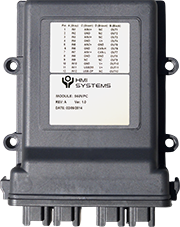 The 524Am is a CAN based alarm module.The overlay provides a single switch for local acknowledgment of the alarm and 2 led indicators for warning or error conditions. The software is integrated with HMI CANconnect software suite. 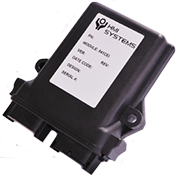 The 540SIM Sensor Input Module) is CAN based five channel analog input module that will read a variety of different analog sensors and convert them to a user definable CAN message. The compatible analog signals are 0-5V,4-20mA and 0-300ohms, one channel 4-20mA and one channel 0-50V. The software is integrated with HMI CANconnect software suite. The 541CEI (CAN Eight Input) is a CAN (J1939) based eight channel digital input module that will read up to 8 multi configurable digital inputs and convert them to a user definable CAN message. The compatible signals are active high, active low, and dry contact. All eight channels can be individually configured through software to detect any of the compatible levels. 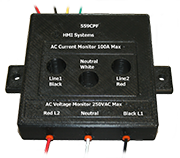 The 559CPF is a power and frequency monitor that communicates using the RV-C standard. 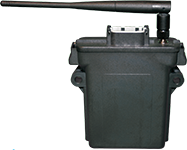 The 560VPC is a rugged, all weather PLC with numerous I/O capabilities. The housing from Deutsch allows it to be used in a wide range of harsh environmental conditions. It features twelve digital inputs, twelve current sourcing outputs (5A maximum each), and four 12-bit analog inputs. All out- puts have internal short circuit pro- tection that can notify and be reset by the user. The 568WICD is a CAN to Wi-Fi bridge for interfacing a vehicle CAN bus with external devices. If a network access point is already available, the 568WICD can link up and reside as a node on that network. If no access point is available, the 568WICD will create an ad hoc network that can be used to pair with HMI Systems CANvis iOS app available from iTunes.